This article is about the famous assassin of Julius Caesar. For other people with the same cognomen, see Brutus. For other people with similar names, see Junia (gens) § Junii Bruti. Marcus Junius Brutus (the Younger) (/ˈbruːtəs/; 85 BC – 23 October 42 BC), often referred to as Brutus, was a politician of the late Roman Republic. After being adopted by his uncle he used the name Quintus Servilius Caepio Brutus, but eventually returned to using his original name. He took a leading role in the assassination of Julius Caesar. Brutus was close to General Julius Caesar, the leader of the Populares faction. However, Caesar's attempts to assume greater power for himself put him at greater odds with the Roman elite and members of the Senate. Brutus eventually came to oppose Caesar and fought on the side of the Optimates faction, led by Pompey the Great, against Caesar's forces in Caesar's Civil War. Pompey was defeated at the Battle of Pharsalus in 48 BC, after which Brutus surrendered to Caesar, who granted him amnesty. Marcus Junius Brutus Minor (Classical Latin: [ˈmaːr.kʊs ˈjuː.ni.ʊs ˈbruː.tʊs ˈmɪ.nɔr]) was the son of Marcus Junius Brutus Maior and Servilia. His father was killed by Pompey the Great in dubious circumstances after he had taken part in the rebellion of Lepidus; his mother was the half-sister of Cato the Younger, and later Julius Caesar's mistress. Some sources refer to the possibility of Caesar being his real father, despite Caesar's being only 15 years old when Brutus was born. Brutus' uncle, Quintus Servilius Caepio, adopted him in about 59 BC, and Brutus was known officially for a time as Quintus Servilius Caepio Brutus before he reverted to using his birth-name. Following Caesar's assassination in 44 BC, Brutus revived his adoptive name in order to illustrate his links to another famous tyrannicide, Gaius Servilius Ahala, from whom he was descended. Brutus held his uncle in high regard and his political career started when he became an assistant to Cato, during his governorship of Cyprus. During this time, he enriched himself by lending money at high rates of interest. Brutus was also active in the province of Cilicia, in the year before Marcus Tullius Cicero was proconsul there; Cicero documents how Brutus profited from money lending to the provincials in his Letters. He returned to Rome a rich man, where he married Claudia Pulchra. From his first appearance in the Senate, Brutus aligned with the Optimates (the conservative faction) against the First Triumvirate of Marcus Licinius Crassus, Gnaeus Pompeius Magnus, and Gaius Julius Caesar. When Caesar's Civil War broke out in 49 BC between Pompey and Caesar, Brutus followed his old enemy and the present leader of the Optimates, Pompey. When the Battle of Pharsalus began on August 9, Caesar ordered his officers to take Brutus prisoner if he gave himself up voluntarily, but to leave him alone and do him no harm if he persisted in fighting against capture. Caesar's concern, given that he and Brutus' mother Servilia had been lovers in their youth, was that Brutus might be his biological son. Indeed, he and Brutus enjoyed a close relationship at this time. 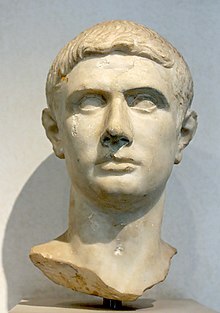 Even when Brutus joined Pompey the Great to fight with Caesar and his soldiers, Caesar's main focus was Pompey, but he demanded Brutus be captured alive. After the defeat of the Optimates at the Battle of Pharsalus, Brutus surrendered and wrote to Caesar with apologies. Caesar immediately forgave him. Caesar then accepted him into his inner circle and made him governor of Gaul when he left for Africa in pursuit of Cato and Metellus Scipio. In 45 BC, Caesar nominated Brutus to serve as urban praetor for the following year. Also, in June 45 BC, Brutus divorced his wife and married his first cousin, Porcia Catonis, Cato's daughter. According to Cicero the marriage caused a semi-scandal as Brutus failed to state a valid reason for his divorce from Claudia other than he wished to marry Porcia. The marriage also caused a rift between Brutus and his mother, who was resentful of the affection Brutus had for Porcia. Around this time many senators began to fear Caesar's growing power, following his appointment as dictator in perpetuity. The other senators persuaded Brutus to join the conspiracy against Caesar. Eventually, Brutus decided to move against Caesar after Caesar's king-like behavior prompted him to take action. His wife was the only woman privy to the plot. The conspirators planned to carry out their plot on the Ides of March (March 15) that same year. On that day, Caesar was delayed going to the Senate because his wife Calpurnia tried to convince him not to go. The conspirators feared the plot had been found out. Brutus persisted, however, waiting for Caesar at the Senate, and allegedly still chose to remain even when a messenger brought him news that would otherwise have caused him to leave. When Caesar finally did come to the Senate, he was distracted by Tillius Cimber, who presented Caesar with a request to free his exiled brother. Caesar dismissed him, and Cimber subsequently grabbed his toga. "Why this violence?" Caesar asked. At this, the conspirators attacked Caesar. Publius Servilius Casca Longus was allegedly the first to attack him, with a stab to the shoulder, which Caesar blocked. However, upon seeing Brutus was with the conspirators, Caesar covered his face with his toga and resigned himself to his fate. The conspirators attacked in such numbers that they even wounded one another. Brutus is said to have been wounded in the hand and in the legs. After the assassination, the Senate passed an amnesty on the assassins. This amnesty was proposed by Caesar's friend and co-consul Mark Antony. Nonetheless, uproar among the population against the assassins caused Brutus and the conspirators to leave Rome. Brutus settled in Crete from 44 to 42 BC. In 43 BC, after Octavian received his consulship from the Roman Senate, one of his first actions was to have the people who had assassinated Julius Caesar declared murderers and enemies of the state. Cicero, angry at Octavian, wrote a letter to Brutus explaining that the forces of Octavian and Mark Antony were divided. Antony had laid siege to the province of Gaul, where he wanted a governorship. In response to this siege, Octavian rallied his troops and fought a series of battles, culminating in the Battle of Mutina, in which Antony was defeated. Upon hearing that neither Mark Antony nor Octavian had an army large enough to defend Rome, Brutus rallied his troops, which totalled about 17 legions. When Octavian heard that Brutus was on his way to Rome, he made peace with Antony. Their armies, which together totalled about 19 legions, marched to meet Brutus and his ally, fellow assassin Gaius Cassius Longinus, thus beginning the Liberators' civil war. The two sides met in two engagements known as the Battle of Philippi. The first was fought on October 3, 42 BC, in which Brutus defeated Octavian's forces, although Cassius was defeated by Antony's forces, and subsequently committed suicide. The second engagement was fought on October 23, and ended in Brutus' defeat. EID MAR ("Ides of March") denarius, issued by Marcus Junius Brutus in 43/42 BC. The obverse of the coin features a portrait of Marcus Brutus. The inscription reads BRVT IMP L PLAET CEST, which means Brutus, Imperator, Lucius Plaetorius Cestianus. Lucius Plaetorius Cestianus was the moneyer who actually managed the mint workers who produced the coin. The two daggers on the reverse differ to show more than one person was involved in the slaying. The cap is a pileus (liberty cap) that in Roman times was given to slaves on the day of their emancipation – freedom from slavery. In the context of the assassination, Brutus is making it clear the killers were defending the Republic and its people from Caesar's attempt to attain kingship. A gold aureus with the same design was also minted. Both coins are exceptionally rare. After the defeat, he fled into the nearby hills with only about four legions. 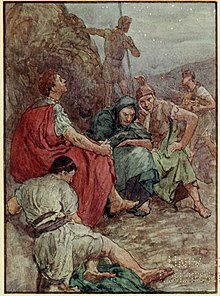 Knowing his army had been defeated and that he would be captured, Brutus committed suicide by running into his own sword being held by two of his own men. Among his last words were, according to Plutarch, "By all means must we fly; not with our feet, however, but with our hands". Brutus also uttered the well-known verse calling down a curse upon Antony (Plutarch repeats this from the memoirs of Publius Volumnius): Forget not, Zeus, the author of these crimes (in the Dryden translation this passage is given as Punish, great Jove, the author of these ills). Plutarch wrote that, according to Volumnius, Brutus repeated two verses, but Volumnius was only able to recall the one quoted. Mark Antony, as a show of great respect, ordered Brutus' body to be wrapped in Antony's most expensive purple mantle (this was later stolen, and Antony had the thief executed). Brutus was cremated, and his ashes were sent to his mother, Servilia. His wife Porcia was reported to have committed suicide upon hearing of her husband's death, although, according to Plutarch (Brutus 53 para 2), there is some dispute as to whether this is the case: Plutarch states that there was a letter in existence that was allegedly written by Brutus mourning the manner of her death. 85 BC: Brutus was born in Rome to Marcus Junius Brutus The Elder and Servilia. 58 BC: He was made assistant to Cato, governor of Cyprus, which helped him start his political career. 53 BC: He was given the quaestorship in Cilicia. 49 BC: Brutus followed Pompey to Greece during the civil war against Caesar. 48 BC: Brutus was pardoned by Caesar. 46 BC: He was made governor of Gaul. 45 BC: He was made Praetor. 44 BC: Murdered Caesar with other liberatores; went to Athens and then to Crete. 42 BC: Battle with Mark Antony's forces and suicide. And say to all the world "This was a man!" The phrase Sic semper tyrannis! ["thus, ever (or always), to tyrants!"] is attributed to Brutus at Caesar's assassination. The phrase is also the official motto of the Commonwealth of Virginia. In 1787, the Anti-Federalist Papers were written under the pseudonym "Brutus" in reference to Caesar's assassin who tried to preserve the Republic. John Wilkes Booth, the assassin of Abraham Lincoln, claimed to be inspired by Brutus. Booth's father, Junius Brutus Booth, was named for Brutus, and Booth (as Mark Antony) and his brother Edwin (as Brutus) had performed in a production of Julius Caesar in New York City just six months before the assassination. On the night of the assassination, Booth is alleged to have shouted "Sic semper tyrannis" while leaping to the stage of Ford's Theater. Lamenting the negative reaction to his deed, Booth wrote in his journal on April 21, 1865, while on the run, "[W]ith every man's hand against me, I am here in despair. And why; For doing what Brutus was honored for ... And yet I for striking down a greater tyrant than they ever knew am looked upon as a common cutthroat." Booth was also known to be greatly attracted to Caesar himself, having played both Brutus and Caesar upon various stages. In Dante's Inferno, Brutus is one of three people deemed sinful enough to be chewed in one of the three mouths of Satan, in the very center of Hell, for all eternity. The other two are Cassius, who was Brutus's fellow conspirator, and Judas Iscariot (Canto XXXIV). Dante condemned these three in the afterlife for being treacherous to their masters. William Shakespeare's play Julius Caesar depicts Brutus' internal struggles, his assassination of Caesar with the other conspirators, and their subsequent downfall. In the final scene, Mark Antony describes Brutus as "the noblest Roman of them all", for he was the only conspirator who acted for the good of Rome. In the play, the dying Caesar says "Et tu, Brute?" ("Brutus, you too? "), although they are not his last words, and the sources describing Caesar's death disagree about what his last words were. The 1911 Italian silent film Brutus portrays the life of Brutus. 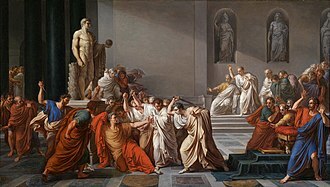 The Ides of March is an epistolary novel by Thornton Wilder dealing with characters and events leading to, and culminating in, the assassination of Julius Caesar. In the Masters of Rome novels of Colleen McCullough, Brutus is portrayed as a timid intellectual whose relationship with Caesar is deeply complex. He resents Caesar for breaking his marriage arrangement with Caesar's daughter, Julia, whom Brutus deeply loved, so that she could be married instead to Pompey the Great. However, Brutus enjoys Caesar's favor after he receives a pardon for fighting with Republican forces against Caesar at the Battle of Pharsalus. In the lead-up to the Ides of March, Cassius and Trebonius use him as a figurehead because of his family connections to the founder of the Republic. He appears in Fortune's Favourites, Caesar's Women, Caesar and The October Horse. Brutus is an occasional supporting character in Asterix comics, most notably Asterix and Son in which he is the main antagonist. The character appears in the first three live Asterix film adaptations – though briefly in the first two – Asterix and Obelix vs Caesar (played by Didier Cauchy) and Asterix at the Olympic Games. In the latter film, he is portrayed as a comical villain by Belgian actor Benoît Poelvoorde: he is a central character to the film, even though he was not depicted in the original Asterix at the Olympic Games comic book. Following sources cited in Plutarch, he is implied in that film to be Julius Caesar's biological son. In the TV series Rome, Brutus, portrayed by Tobias Menzies, is depicted as a young man torn between what he believes is right, and his loyalty to and love of a man who has been like a father to him. In the series, his personality and motives are somewhat inaccurate, as Brutus is portrayed as an unwilling participant in politics. In the earlier episodes he is frequently inebriated and easily ruled by emotion. Brutus' relationship to Cato is not mentioned, and his three sisters and wife Porcia are omitted from the series completely. The Hives' song "B is for Brutus" contains titular and lyrical references to Junius Brutus. Red Hot Chili Peppers song "Even You Brutus?" from their 2011 album I'm with You makes reference to Brutus and Judas Iscariot. The video game Assassin's Creed: Brotherhood features a small side story in the form of the "Scrolls of Romulus" written by Brutus, which reveals that Caesar was a Templar, and Brutus and the conspirators were members of the Roman Brotherhood of Assassins. At the end of the side quest, the player is able to get Brutus' armor and dagger. Later at Assassin's Creed Origins, Brutus and Cassius make an appearance as Aya's earliest recruits and is the one who give the killing blow to Caesar, though his armor from Brotherhood does not make an appearance here. In Tina Fey's teen movie Mean Girls, one of the main characters delivers a monologue about Brutus and how he is just as good as Caesar, saying, "And when did it become okay for one person to be the boss of everybody, huh? Because that's not what Rome is about. We should totally just stab Caesar!" ^ Plutarch, Life of Brutus, 5.2. ^ "Coin bearing inscription Q. Caepio Brutus". oldcoin.com.au. Archived from the original on 2011-07-06. Retrieved 2011-01-16. ^ Plutarch, Life of Brutus, 2.1. ^ Plutarch, Life of Brutus, 3.1. ^ Cicero. ad Fam. iii. 4. ^ Plutarch, Life of Brutus, 5.1. ^ Plutarch. "Marcus Brutus". Retrieved January 7, 2017. ^ Plutarch, Marcus Brutus, 13.3. ^ Cassius Dio, Roman History, 44.8.4. ^ Cassius Dio, Roman History, 44.12.2. ^ Cassius Dio, Roman History, 44.12.3. ^ Plutarch. Marcus Brutus. 15.1. ^ Cassius Dio. Roman History. 44.18.1. ^ Plutarch. Marcus Brutus. 15.5. ^ Getlen, Larry (March 1, 2015). "The real story behind the assassination of Julius Caesar". New York Post. Retrieved January 2, 2017. ^ Plutarch. Marcus Brutus. 17.5. ^ Plutarch. Marcus Brutus. 17.6. ^ Plutarch. Marcus Brutus. 17.7. ^ Nicolaus. Life of Augustus. 24. ^ Plutarch, translated by John Dryden. "Marcus Brutus". Greek Texts. p. 13. Retrieved 2011-01-16. ^ "Marcus Vipsanius Agrippa". Livius.org. 2010-01-02. Retrieved 2011-01-16. ^ "Ancient Greek Online library: Marcus Brutus by Plutarch page 13". Greektexts.com. 2005. Retrieved 2011-01-16. ^ Plutarch, Marcus Brutus, 52.1-53.4. ^ a b Valerius Maximus, De factis mem. iv.6.5. ^ Cassius Dio, Roman History. 47.49.3. ^ Appian, The Civil Wars, Book 5.136. ^ "John Wilkes Booth Manuscript". Baltimore Sun. 26 April 1992. Retrieved 24 December 2013. ^ "Gretchen Wieners (Character)". IMDb. Retrieved 2017-10-05. Clarke, M. L. (1981). The Noblest Roman. Ithaca, NY: Cornell University Press. Corrigan, Kirsty (2015). Brutus - Caesar's Assassin. Barnsley: Pen & Sword Military. Heitland, W. E. (1909). The Roman Republic. Cambridge: Cambridge University Press. Parenti, Michael (2003). The Assassination of Julius Caesar. New York: New Press. Syme, Ronald (1939). The Roman Revolution. Oxford: Oxford University Press. Tempest, Kathryn (2017). Brutus: The Noble Conspirator. New Haven, CT: Yale University Press. Wistrand, Erik (1981). The Policy of Brutus the Tyrannicide. Goteborg, Sweden: Kungl. Wikimedia Commons has media related to Marcus Junius Brutus.